Lotus Élan (M100). 1989–92 (prod. 3,855). 2-door convertible. F/F, 1588 cm³ (I4 DOHC). 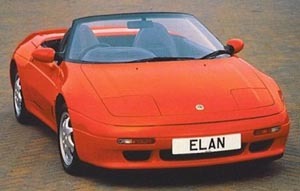 Lotus revives Élan nameplate while under GM ownership. Front-drive for a sports car thought of as sacrilege until the car was tested: it was regarded as the finest-handling front-driver on the market. Critics felt it was too safe a handler and lacked feedback. Isuzu turbocharged engine and drivetrain. Expensive, and flopped particularly in the US.